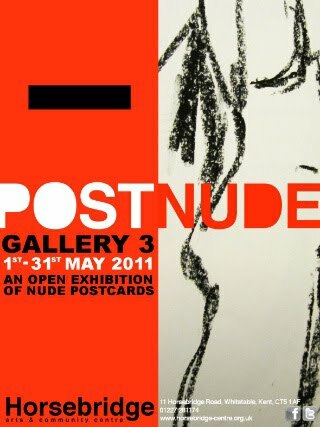 [*Shameless headline to attract attention] Recently I went to Whitstable to check out this exhibition of nudes on postcards to which I contributed. Anyone could enter and the cards were stuck, unframed, on the gallery walls. A simple idea which produced a huge range of interpretations and a very enjoyable show. All entries had to be submitted via the mail. So, as you can see, mine is a bit crumpled and some franking is visible. This added to the charm of the entries, I felt. The exhibition, at the Horsebridge Arts Centre, was a gesture of solidarity for staff at the local Whistable sorting office which is under threat of closure. 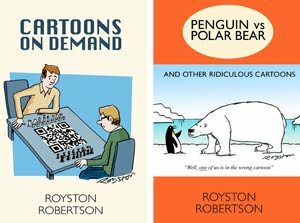 My card is a version of this Private Eye cartoon. 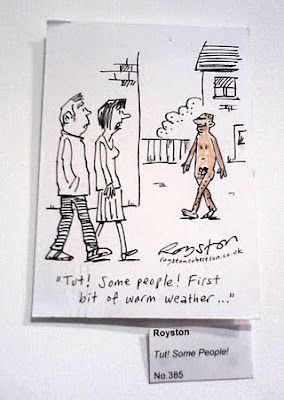 I was pleased to see that a lot of the artworks approached the subject with humour. And here's the original version, which contains the line "He don't care about Colonel Gaddafi/He's having a fag down the Tudor Cafe". Genius. Headline guaranteed to make people click. Not me, obviously, I'm just interested in the art. That goes without saying, Isle. I wasn't referring to people of taste, of course. Very good! Yes, I like the crumpled 'been throught the mail system' look of it too - bet it gave a few postmen a chuckle! I took part in a postcard swap with American cartoonists on the Wisenheimer board about 10 years ago - ended up with about 30 postcards, mostly originals. Was great fun.